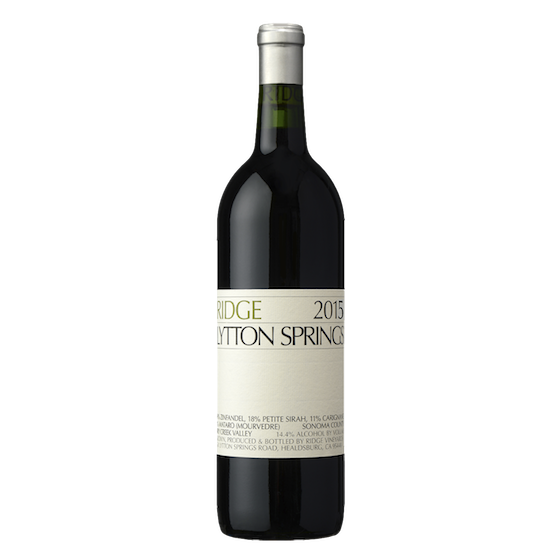 On Ridge’s East Lytton Estate, Zinfandel grows on seven hilltops: Petite Sirah surrounds the Zinfandel on six, Grenache on the seventh. It’s an unusual configuration. The West Lytton Estate vineyard, on the other hand, is a magnificent hodgepodge of grapes, including more Zinfandel, which seems at home there. The balanced, powerful wine made from this fruit ages beautifully, becoming more nuanced and expressive with time. Ridge is a minimal-intervention winemaking pioneer. The sustainably-grown fruit was hand-picked, de-stemmed, and crushed (except the Petite Sirah, which was whole-berry pressed), then fermented by native yeast. The winery managed colour and tannin extraction by limiting pump-overs to once daily. Following naturally-occurring malolactic fermentation, 24 of the 33 small fermentation lots were selected for their concentrated fruit and elegant structure. These lots were transferred to American oak (15% new, 85% used) for 14 months maturation. Handling, added sulfur, and fining were kept to a minimum. This is an excellent vintage: appealing now, and certain to improve over the next decade. The wine shows the potent jammy fruit of old-vine Sonoma Zinfandel with notes of brambly raspberry, pepper, mint, and toasted oak. That intricacy comes in part from the blend, a thoughtful combination of 74% Zinfandel, 16% Petite Sirah, 8% Carignane, and 2% Mataro (Mourvedre). Acidity and tannin structure are firm, but not overwhelming.